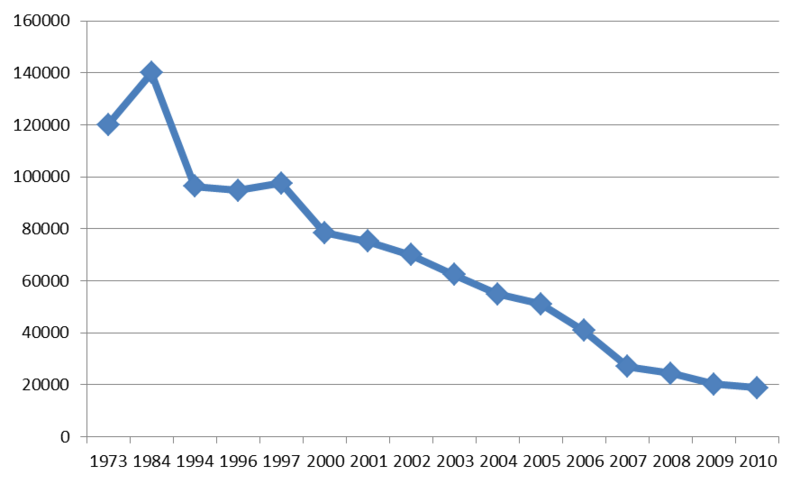 The graph below illustrates the number of Kodak employees over time. It suggests that the company’s decline was not only attributable to digital imaging and lost film revenues. The problems started much earlier and are largely related to the emergence of FujiFilm as a serious competitor on the global stage. Read more about the Kodak vs Fuji case here. This entry was posted in Kodak and tagged bankruptcy, Digital imaging, Fujifilm, Kodak by admin. Bookmark the permalink. Does the decline of emoloyees correlate with dropped revenue? Is there a revenue chart available? It does. I don’t have figures from the 1980s yet, but Kodak had a turnover of 15$Bn in 1996. In 2010, revenues were about 7$Bn. Thus the decline in employees is much steeper, indicating that the shift to digital imaging created a tougher competitive climate which forced Kodak to lay off a lot of people and slim down.